Cream the sugar and oil together; add the eggs and beat well. Add the vinegar and food coloring; beat well. Sift dry ingredients together and add alternately with the milk. Add the vanilla and beat well. Pour into prepared cake pans (2-8 or 13x9) and bake at 350 degrees for 30-35 minutes or until cake tester comes out clean. 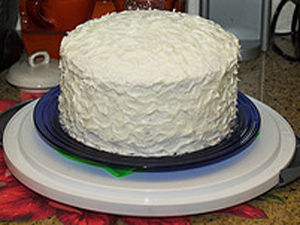 cakerecipes-r-us.com is continually updated with new recipes and articles. Check back often to see what's new or, use the "Subscribe To This Site" box to receive updates as soon as they are published. All recipes are credited to original sources, if known.